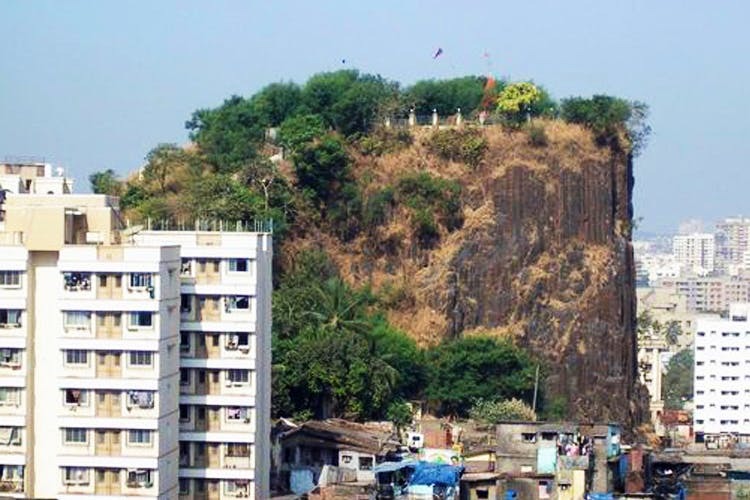 A not-so-hidden gem bang in the middle of Andheri West which often stands like a sore sight, the tall, blackened Gilbert Hill has one of the best panoramic views of the city. Gilbert hill is possibly the oldest standing piece of nature’s creation India has seen. This almost 200 feet tall monolith structure is dated 66 million years old – primarily made up of basalt rock. Studies show it was formed during the Mesozoic era – owing to the volcanic eruptions from the Earth – with the only other similar formation on Earth being present in the USA, called the Devil’s Tower. The name, Gilbert Hill, coined by the British has since stuck, but this place isn’t attracting enough tourists. So we decided to check it out. We revisited this hill and found a discarded shoddy hill unlike what its glorious history proclaims. It’s really easy to get there, just get an auto towards Bhavans college and you can walk from there. Though it’s surrounded by the slums that have cropped up alongside it, as well as the mirage of white sky rocketing building, the hill stands tall and beckoning. Start the climb from the staircase that’s been carved out of the rocks at the foothills of Gilbert. After about five minutes, we were at the top. There’s an old Hindu temple here, that’s been around for decades, Gaodevi Durgamata – which also sees a lot of crowd during the festival of Hanuman Jayanti. We walked around the temple on the grass paths, and loved every bit of it. It has a beautiful, uncontested view of the city from all directions. You can see as far as the city is from the shiny Arabian sea to the high rises of modern Lokhandwala to the metro line. Turn north-east and be greeted by the green forest pastures of Aarey Milk colony. It gives us one of the best vantage points to the suburban areas of Mumbai, even giving us a glimpse all the way to Worli – just squint and you’ll see. The views of beaches and the sea, however, is what really had a calming effect on us. Catch one of the best sunsets you can from here – coloured skies like a painted canvas. Relax under the shades of the trees, have a small quick picnic or just come here to unwind from the city stress with views that are rare to find in the city. Though the sprawling slums barely a few meters from the hill can put off a few people, the view from the top is worth a visit. For the Andheri dwellers, perfect for a quick jog up to the hill. How to get there: Get off at Andheri Station and take an auto towards Bhavans College. From there, it’s at a walking distance. We recommend going here before 7pm.